When most people think of Chinese social media stocks, Weibo (NASDAQ:WB) and Tencent (OTCMKTS:TCEHY) generally come to mind. The former has been deemed the “Twitter of China,” though it increasingly looks and feels like Facebook (NASDAQ:FB). The latter, meanwhile, is the name behind China’s most popular messaging platform, WeChat. A smaller company called Momo (NASDAQ:MOMO) doesn’t often factor in. Investors who’ve kept close tabs on the advent of internet connectivity in China will likely know Weibo and Tencent were all the rage not too long ago, dishing out triple-digit gains in 2017. More than half-way through 2018, both have been hit hard. As it turns out, many of those sellers have flocked to MOMO stock, nearly doubling its price this year. Normally that move would be too intimidating to chase. But there may be at least a little more upside in store for Momo, if not a lot more. What’s Momo? It’s difficult to explain, as there’s not a clear comparison to it. In simplest terms, the company has monetized short videos of users as the key feature of what’s essentially a dating app. Members pay a fee, though the company also gleans a little revenue in more conventional ways (like advertising). Whatever it is, users love it. Momo now boasts more than 100 million monthly users who generated nearly $500 million worth of revenue last quarter. Last quarter’s per-share profit of 66 cents doubled the year-ago bottom line of 33 cents, and sales were up 58% year-over-year. Last quarter’s explosive growth wasn’t a fluke, or unusual. The company’s been forging ahead at a comparable pace for over a year now. 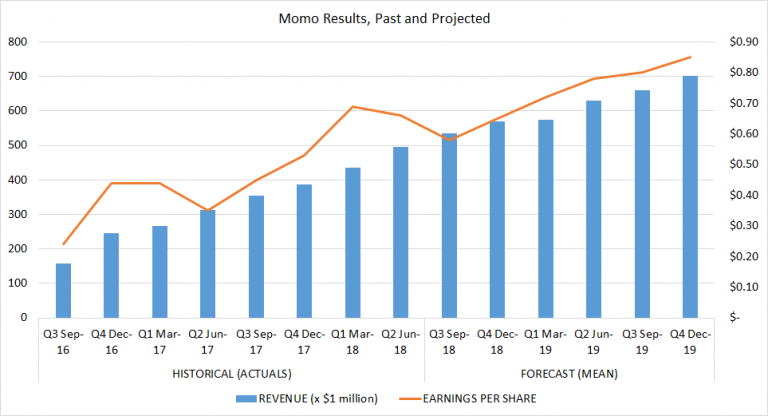 Analysts have taken note, modeling operating profits of $3.23 per share of MOMO stock next year, up 26% from this year’s expected bottom line. Last year, the company earned $1.77 per share. End result? The pros collectively say MOMO is worth $56.43 per share. The consensus rating is just a bit better than “Buy,” edging toward a maximum rating of “Strong Buy.” That stance matches the consensus rating on Weibo, and is better than the average opinion of Tencent. Those analysts may be on to something, though. That is, if the company only continues to grow as it has been, that forward P/E of 14.6 is more than justifiable. The trajectory speaks for itself. The X-factor: In February, Momo opted to acquire Tantan, which is comparable to the North American dating app Tinder, effectively doubling down on its dating focus. It remains to be fully seen exactly how the Tantan integration will be used to augment both sites’ growth. But, given the commonality of the customers, synergies shouldn’t be tough to realize. Analysts’ collective forecasts may not fully reflect just how much more Momo could accomplish with Tantan in tow. As for where MOMO stock might end up in the foreseeable future, this is one of those rare instances where the proverbial stars have perfectly aligned. Momo shares haven’t always consistently reflected the company’s results and growth prospects. Although they’ve nearly doubled in value this year, the current price of $47.37 is well off from its June peak of $54.25. This year’s action also got started with the added advantage of more than a 50% pullback during the latter half of last year. Those pullbacks serve as the underpinnings of opportunity for newcomers though, and there’s room to run for multiple reasons. One has to zoom out to a weekly chart of MOMO to see it, but it’s there. The stock’s been guided by a rather wide trading range since 2016, framed by dashed lines on the nearby chart. Although it’s up quite a bit year-to-date, there’s still plenty of room for the rally to play out as it has in the past. Exactly where is that upper boundary — or will it be — by the time the stock could feasibly bump into it? 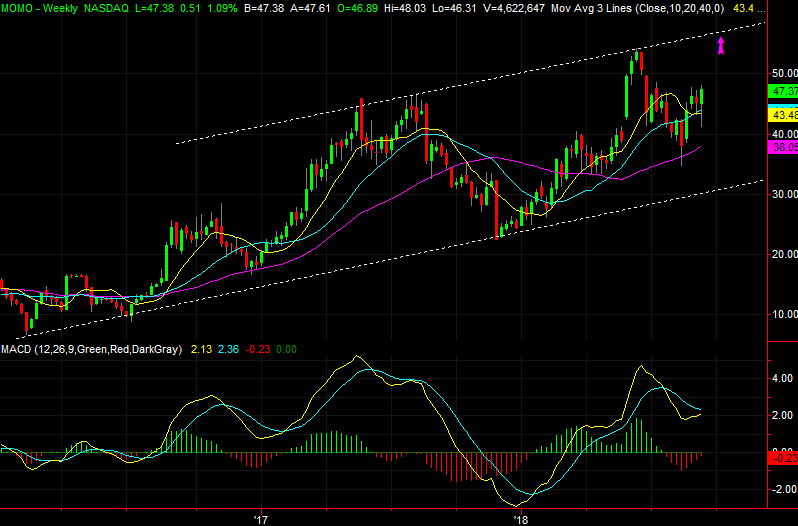 Right around $56, or close to the consensus analyst target of $56.43. It’s not likely to be a coincidence. Intended or not, quite often a chart, the fundamentals and analysts are working together. At a price of $56, the forward P/E is on the order of 17.4 — a perfectly palatable valuation, given the company’s growth pace. Indeed, it may still undervalue the stock. A guarantee? They don’t exist. From a risk-versus-reward perspective though, there’s not a lot not to like. One could certainly do a lot worse. 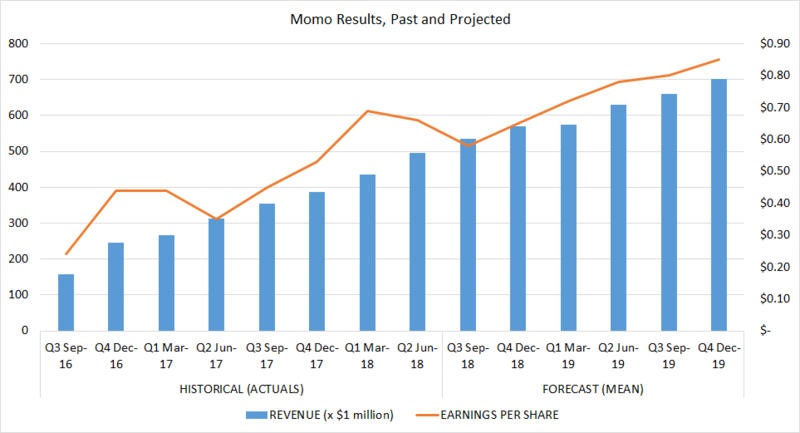 Article printed from InvestorPlace Media, https://investorplace.com/2018/09/one-chart-tells-you-all-you-need-to-know-about-where-momo-stock-is-going/.